This month we focused on tweaking existing systems and balancing game objects based on feedback from playtests. There are a few big issues left to solve such as giving players more control over how they gain cards but the game is fairly stable and is still very fun to play. We have been working hard to speed up the game and make it easier for players to arrive at correct decisions to reduce analysis paralysis. At the start of the month a four player game took around 4 hours to complete and we have brought that down to 1.5 hours, which was our goal. I thought I’d share how we sped up the game in this post. Using metrics – We started timing how long it takes players to finish each phase of a turn and used that data to focus our efforts. We didn’t do this right away so we ended up optimizing phases that only yielded a saving of around 10 minutes. The result was more elegant systems that were easier to learn and use. 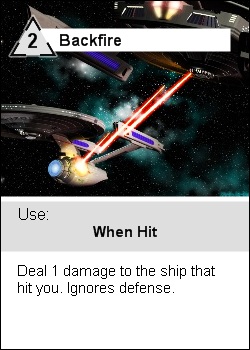 Removing cards that slowed down the game – Most of the Tech cards and quite a few of the ships prolonged combat because they were defensive in nature. Both of us like playing defensively in other board games so this subconsciously affected our design. Now that we are aware of the issue we have a column in our spreadsheet indicating if a card speeds up, slows down, or does not affect combat speed. 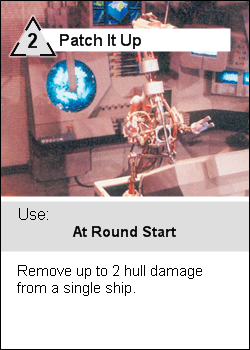 The biggest offenders were cards that repaired ships or prevented damage. For example we removed Patch It Up and replaced it with Backfire. Made ships weaker – We reduced the hull strength (health) of a handful of ships slightly. Originally we felt ships were dying too fast so we gave the more hull strength. Simpler ships – Every ship had a unique ability that required players to remember or read multiple times. We didn’t have many vanilla ships (no abilities) so we got rid of some abilities and made others less complicated. This lead to quicker decision making during combat. A lot of these changes were incremental but the net result is a significantly shorter playtime. This month we will focus on theme and art direction while tying up loose ends and playtesting. Space Victory is a card game I’ve been working on for the past few months with my friend Lanz Singbeil. It’s a spaceship combat game that can be played with 2-4 players. Players build spaceships, send them to planets, and engage in combat to claim planets for victory points. The combat system uses dice to determine hits and includes a damage system and other ways to change the odds. There are more systems but I’ll cover them in future posts. Currently we are in the design phase and are playtesting it with people whenever we have the chance. The game is a blast to play and is already nicely balanced. There are a few systems we need to finalize and a handful of problems to address but the hard parts are done. I plan to talk about the evolution of the design, the tools we’re using, and how we solved specific design problems in future posts. 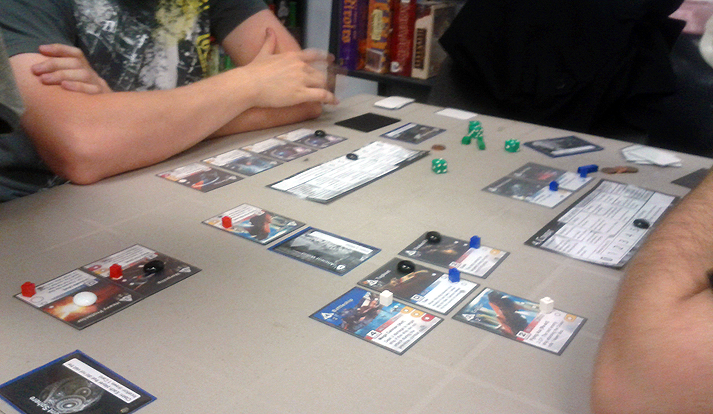 For now here’s a picture from the latest playtest. The cards have art found through Google image search. We have not figured out the art direction yet. I'm an independent game developer located in British Columbia, Canada.